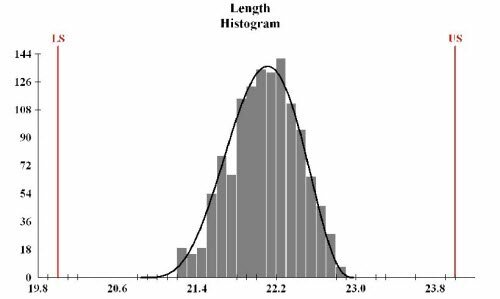 These Histogram examples are a graphical picture of data. The X axis is the measurement. The Y axis is the frequency for that measurement. Some graphs have a red LS, NS or US. The LS stands for Lower Specification. The NS stands for nominal specification (or target). The US stands for upper specification. For 100% Quality all data must be between LS and US. On some graphs, I drew a curve. The curve represents the shape of the data. If the curve is bell shape then the data is normally distributed. When the data is normal then we can apply certain statistical methods. This includes concepts such as average, standard deviation, and CpK. These histograms show how data fits specifications. If the data is bell shaped, we can apply the term CpK. CpK allows us to make a statistical prediction about the data set. CpK predicts how many parts out of a given sample size may be defective. Most manufacturing processes follow the bell shape curve. Because of this we can apply SPC and other tools to control the process. Graph A data is normally distributed. Graph A data is a bell shaped curve. The mean, mode and median look to be very close to each other. Graph B data is normally distributed. The data is not centered between the specifications. If we sampled more parts there is a good chance that parts would fall above the upper specification (US). If we manufactured this product we would want to adjust the product so most data is closer to the nominal specification. Graph C is not normally distributed most of the data is to the left of the graph. The average, mode and median are not close to each other. In this Histogram examples, graph D does not have a bell shaped curve. It is not normally distributed. Most of the data falls within the specification. Yet most is close to the upper specification. It looks like the manufacturing process limits the data from going above the upper specification. But the process allowed data to go below the lower specification. The process is not capable of meeting the specifications. Graph E has an unusual bell curve. The process has many data points below the specification. The process is not capable of meeting specifications. Graph F represents a normal distribution. Notice how the mean, median, and mode are all relatively close to each other. However, there is data that is out of specification. Graph G has a bell shape curve and is normally distributed. It has a CpK value of 1.5. All of the data from the process will meet specification. Understanding how to read histogram examples is an important tool in quality assurance. Learn to make histograms in MS Excel.